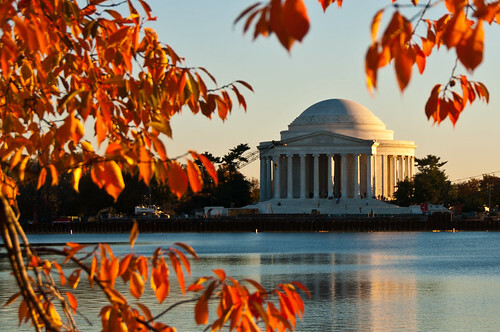 This morning marks the 71st anniversary of the laying of the cornerstone of my favorite DC memorial, the Jefferson Memorial on the south side of the Tidal Basin. The Memorial was designed by architect John Russell Pope in 1935, and was one of four that Pope designed, depending on the location that was finally chosen for the monument. 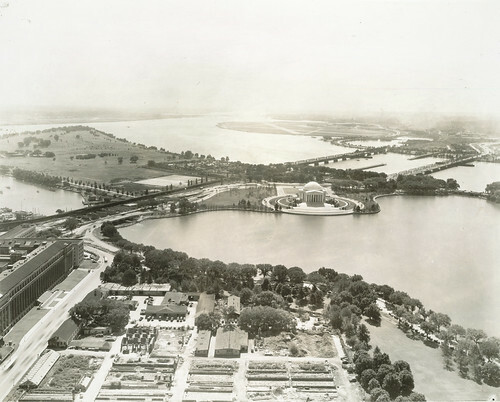 The other three sites that weren’t chosen were along the Anacostia River near where RFK sits today, at Lincoln Park, and one across from the National Archives, which Pope also designed. The Memorial’s architectural features are, itself, a tribute to Jefferson’s style: Ionic columns, a flat dome, a Roman-style Portico, all things that are present at Jefferson’s university in Charlottesville, the University of Virginia. The Memorial was, itself, a controversial project. Pope had lost the 1911 competition for the Lincoln Memorial, and was seen by many, despite his design of a number of prominent Washington buildings, as a bit of a show-off, and that wasn’t what they were looking for in the Memorial. His initial Pantheon proposal was 21 feet taller than the Lincoln Memorial, and was tabled by the commission. 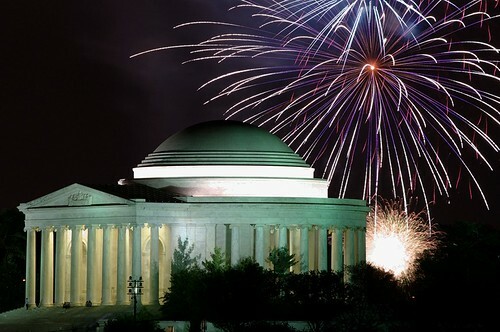 The supporters of the third president’s memorial were a tenacious group with significant backing in the Congress, and the memorial was built over the objections of these groups, who were concerned over denuding the tidal basin (hey, doesn’t that sound familiar?) and that the Beaux-Arts style that Pope favored was too grand for an agrarian president like Jefferson. In this, I believe Jefferson was at his finest. I am pleased that this wonderful temple sits at the southern end of the Mall, as Jefferson himself sat, somewhat removed from the hustle and bustle of the city. It is where I go when I need to seek counsel and peace, and by far, my favorite of our memorials. I do think it is probably my favorite of all the memorials and possibly of all the neoclassical buildings in the city.